We are actively engaged in offering a wide gamut of GB Standard Light Rail. The offered product is designed using high grade raw material and latest technology with set universal standards. 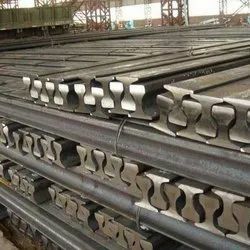 Additionally, the offered product is checked against various parameters of quality under the strict supervision of vendor’s quality controllers to ensure the flawless deliveries. In addition to this, offered products can also be customized as per various specifications from our prestigious clients. To meet diverse requirements of our clients in the best possible manner, we are exporting, importing, trading & supplying a comprehensive assortment of ISCOR Standard Light Rail. Offered products are manufactured by vendor’s skilled professionals using the best technology to render maximum clients' satisfaction. In order to meet variegated demands of clients, this is made available in various customized options. Besides, clients can avail this product at market-leading prices. Looking for Light Rail ?